New Zealand is an island country in the south-western Pacific Ocean comprising two main islands (commonly called the North Island and the South Island), and numerous smaller islands, most notably Stewart Island and the Chatham Islands. The indigenous Māori named New Zealand Aotearoa, commonly translated as “The Land of the Long White Cloud”. New Zealand is situated about 2000 km (1250 miles) southeast of Australia across the Tasman Sea, and its closest neighbours to the north are New Caledonia, Fiji and Tonga. 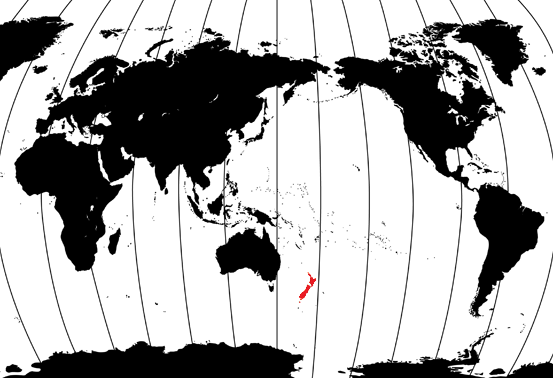 The population of New Zealand is approximately 4.34 million. Auckland, the largest city has a population of 1.4 million, which is about a third of New Zealand’s total population. The major ethnic group is of European descent; while the indigenous Māori are the largest minority. Asians and non-Māori Polynesians are also significant minority groups, especially in urban areas. The most commonly spoken language is English. Where in the world is New Zealand?